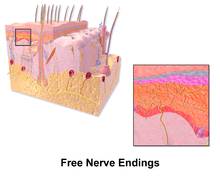 A free nerve ending (FNE) is an unspecialized, afferent nerve ending, meaning it brings information from the body's periphery toward the brain. They function as cutaneous receptors and are essentially used by vertebrates to detect pain. Free nerve ending have different rate of adaptation, stimulus modalities, and fiber types. ↑ Churyukanov M, Plaghki L, Legrain V, Mouraux A (2012). "Thermal detection thresholds of Aδ- and C-fibre afferents activated by brief CO2 laser pulses applied onto the human hairy skin". PLoS ONE. 7 (4): e35817. doi:10.1371/journal.pone.0035817. PMC 3338467 . PMID 22558230.